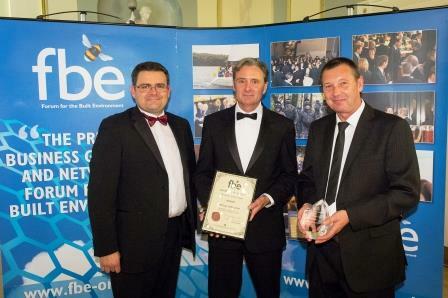 We are delighted to announce that on the 10th October 2013 the Heritage Skills Centre picked up another award at the East Midlands Regional fbe (Forum for the Built Environment)Annual Awards Dinner. The fbe Award for the best scheme and team in Lincolnshire celebrates all the partners who work collaboratively to deliver an exceptional project including Architects, Consultants, Engineers and Contractors. The Heritage Skills Centre is also up for more awards later in the year at the LABC National Awards and the SCALA Awards for the Civic Building of the year. Highfield House another project completed by Robert Woodhead’s sustainable arm Woodhead Living was also shortlisted for the Nottinghamshire scheme and team however was unsuccessful. Pictured left to right: representatives from the Awarding Body, Rob Green, Architect and Peter Winson, Site Manager.